Arab civilian woman volunteering for National service was stabbed this week by a stalker, is in moderate condition. 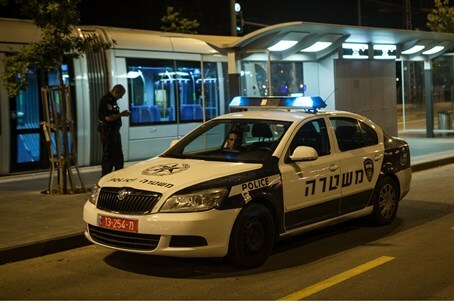 A young Arab woman was stabbed this week while completing her National Service duties. The woman, who is stationed at a police station in the North, suffered from multiple stab wounds after refusing the advances of a stalker. The assailant had approached the woman multiple times. After rejecting his advances, and even asking him to keep his distance, the stalker eventually assaulted her in the station's parking lot. She was stabbed over 8 times all over her body. The volunteer has been hospitalized in fair condition and she has been transferred to the surgery center at Nahariya Western Galilee Medical Center. The perpetrator attempted to flee the scene, but was eventually apprehended by staff from the station and taken in for investigation. Sar-Shalom Gerbi, director of the Civil and National Service Administration, made a personal visit on Sunday to the wounded volunteer's hospital room with members of the Shlomit volunteer group with whom she serves. Gerbi conversed with family members and wished her a full recovery. He also promised her family the full assistance of the Civil and National Service Administration with any future issues. "I take incidents like this very seriously," Gerbi stated. "In the days when legal staff and law enforcement face threats of attack, stabbing a volunteer for the force crosses a red line which cannot be overlooked. I spoke early on in the case with the Minister for Internal Defense, and urged him to bring the attacker to justice." More and more Arabs have been volunteering for National Service, a phenomenon some view as controversial. Christian Arab leadership, in particular, has been supportive of National Service work; this May, an Arab Israeli Greek Orthodox Priest met with Prime Minister Binyamin Netanyahu to discuss the issue and to advocate further Arab involvement in the Service. Nazareth native Father Gabriel Nadaf met with the PM despite death threats, public condemnation by fellow Arabs, and the possibility of being defrocked by the Church for his avid support of the State of Israel. Nadaf insists that he represents a sizable portion of the Christian Arab community who sees themselves "as citizens of the state with all the attendant rights as well as obligations." Nadaf's efforts have apparently borne fruit; approximately 500 Arabs were reported to have served in National Service positions this past year, and Arab conscription in the IDF has also more than doubled since 2011. Netanyahu has expressed support for the upswing. "You are loyal citizens who want to defend the state and I salute you and support you," he said, in a meeting last year with Christian Arab officials.